Splash pad, kids club, live music every night, great value, DJ Chip! Rooms very clean and tidy plenty of wardrobe space and drawers. Had a brilliant stay at Playa Bella we absolutely loved it. Restaurant was great too and the staff. Fabulous accommodation 😊perfect for kids great pool, beach right in front of hotel, lovely food in both restaurants and staff really helpful & friendly...will be back again for sure! Great value for money. Clean and good facilities. Local pubs / restaurants near by. Bus stop outside hotel €4 to and from airport. Boat ride from the beach to San Antonio bay only €3 each also . Entertainment in hotel was alright also. Lots of free beds at pool , and free WiFi and air con also. Great hotel. Would stay again. Clean, great pool for kids - the best by a mile. Restaurant on site with affordable prices. Staff were brilliant! Lock in a great price for Playa Bella Apartments – rated 8.3 by recent guests! Playa Bella Apartments This rating is a reflection of how the property compares to the industry standard when it comes to price, facilities and services available. It's based on a self-evaluation by the property. Use this rating to help choose your stay! 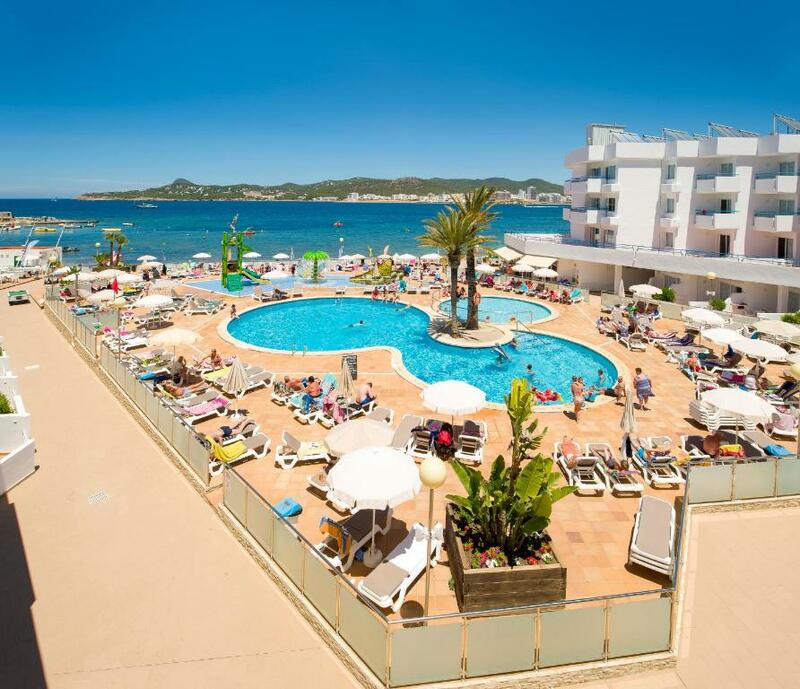 Overlooking Punta Xinxó Beach and the beautiful San Antonio Bay, Playa Bella Apartments have a large swimming pool and children’s splash pool. Each air-conditioned apartment has a flat-screen TV with international channels. Playa Bella’s studios and apartments all have balconies, some with sea views. They also have modern kitchens with a microwave, fridge, toaster and kettle. You can enjoy a drink on the terrace overlooking the Mediterranean, or have dinner in one of the complex’s 2 international restaurants. The Playa Bella offers a wide range of entertainment for children and adults, including nightly shows. The center of San Antonio is just a 2.5 mi drive away. The surrounding area offers a good choice of restaurants and bars. When would you like to stay at Playa Bella Apartments? This air-conditioned studio has 2 sofa beds and a kitchenette with kettle, toaster, oven and fridge. There is satellite flat-screen TV and a balcony or terrace. This air-conditioned apartment has a lounge area with two sofa beds and a separate bedroom with two single beds. It features a kitchenette with kettle, toaster, oven and fridge. There is also a satellite flat-screen TV and a balcony or terrace. This apartment features air conditioning, kitchenware and dining area. This apartment comes with 2 twin bedrooms and 2 single sofas bed in the living room. Playa Bella has 155 apartments and is set on the beach in the beautiful and family friendly bay of San Antonio. 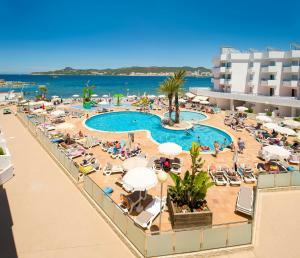 San Antonio Bay is very family friendly with lots of wonderful bars and restaurants around to suit all tastes. House Rules Playa Bella Apartments takes special requests – add in the next step! Playa Bella Apartments accepts these cards and reserves the right to temporarily hold an amount prior to arrival. AC remotes must be given so guests can control the AC temperature. No point of having AC if one cannot set the temperature. Also, sofa bed was very uncomfortable. Location was good. Neat and clean. No soap in the bathroom. Unfriendly welcome on arrival.